The Alliance Tournament ended on Sunday with Vydra Relolded being crowned champions after a great final. This was a splendid end to one of the best Alliance Tournaments in years. 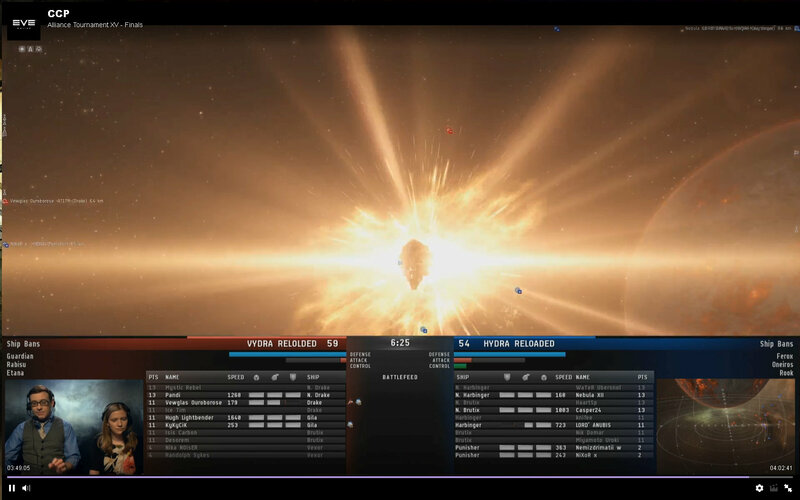 Eve Online is a hard game to project as an e-sport but each year we have seen incremental improvements in the coverage. The camerawork this year was the best it’s ever been, with more zooming in to the action on key plays. It wasn’t perfect, a number of plays, particularly microjump drive leaps, were missed but it’s getting there slowly. The commentary team was stellar. Commentators displayed deep game knowledge and went wholeheartedly for “colour.” (In one commentator’s case that colour was gold). 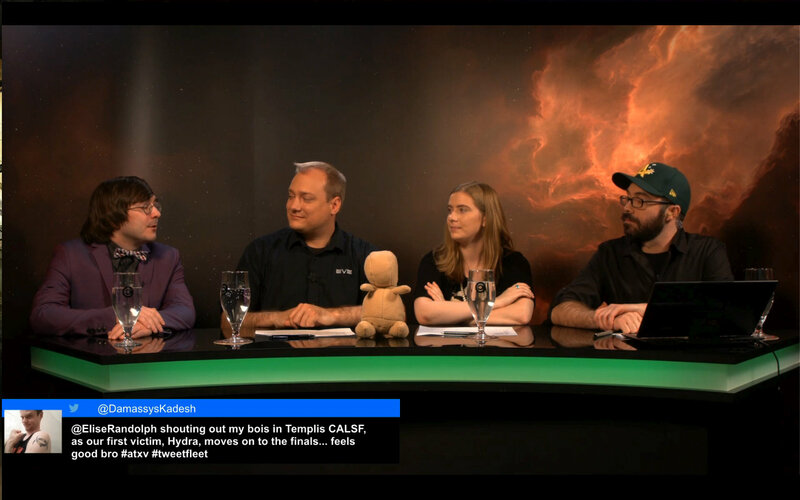 I thought in particular the coverage of the last game of the AT, the deciding match between Hydra and Vydra was on a par with the famous “The Tengu is breaking” commentary by Shadoo and Fozzie in AT XI. It was a very exciting match with Hydra pilot Casper24 going for a clutch play to MJD to safety and seeming to manage it before drifting out of bounds. Meanwhile commentator Mawderator discovered his inner poet. Eve NT’s coverage of the first two weekends was of equally high quality. It felt like the two teams were pushing each other in a very positive way. They also have invented a replay tool which is wonderful. There are still flaws. We kept hearing about “great clouds of drones” when the cameraman was zoomed in somewhere else. Feedback from reddit suggested that new players were feeling swamped by technical terms. (They did take this on board and improve for the final weekend). MJD jumps were often missed both by the camera and by the commentators. Often in a tournament the meta ‘puzzle’ seems to be somewhat solved and teams become very samey. This never happened in AT XV and although the accent was on drones and battlecruisers, we never really saw a dominant team composition. Instead we had a genuine rock-paper-scissors where team captains had to pick a comp and hope the other captain didn’t choose the counter. Meta often comes from ideas for comps that have been used in the past colliding with rules changes. The notable rules changes were an increase in points cost for certain perennial ships: battleship hulls, T2 logi cruisers and command ships, a decrease in points cost for cruisers and battlecruisers and the removal of the restriction on T2 mobile damage drones. 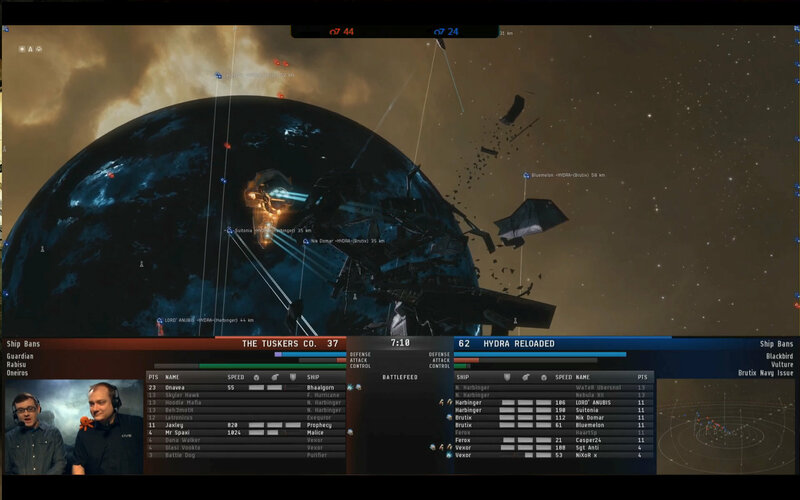 The early comps were dominated by blaster rushes, battlecruisers cores and drone heavy set ups. Blaster rushes are a perennial first weekend comp and usually don’t do well. They were more competitive this year, partly thanks to the Serpentis theme discount which made the Vindicator, Vigilant and Daredevil cheaper. 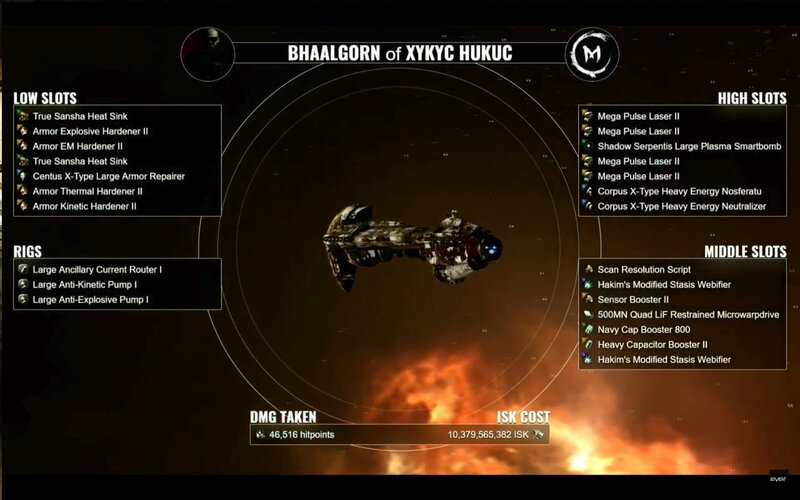 Battlecruiser cores were attempts to steal the comp from last year’s AT that ended up being dominant. That comp was a flagship Bhaalgorn, warped to zero, supported by a core of 4 long range Navy Battlecruisers. This concept however was quite specific to the context of last year’s final weekend and didn’t always translate well to the first weekend context as this unfortunate SNUFF flagship discovered. The drone comps were taken to a new level by those teams that had put in long practice hours into perfecting their use of microjump drive beacons. This point of view from A Band Apart shows how powerful well-timed jumps were this year. You can see the pilots repeatedly escape destruction by well-timed jumps and also see how integral the beacons are to how they are playing the match. We have seen cool MJD plays in the past but never before has it been such an integral part of the gameplay. Nor have teams been so good at it. T2 logistics frigates played a minor role. 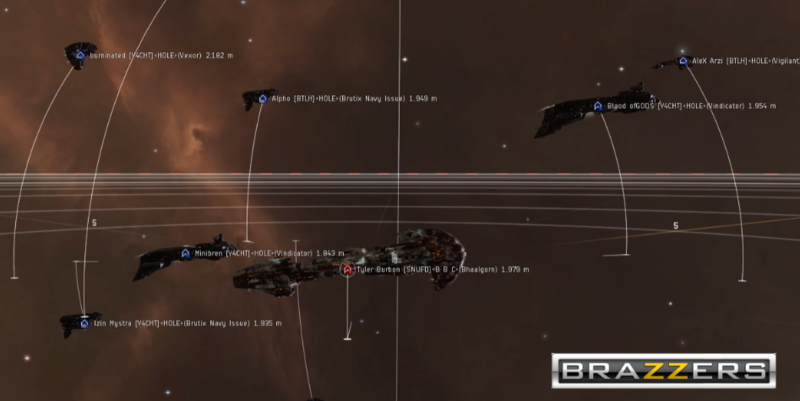 The guristas line of drone ships was made relevant by the T2 drone rules change. We also saw the occasional kitey light missile setup, Sleipnir rush, and Sleipnir headshot comps. (Autocannons and Artillery respectively). From day 5 we started seeing ECM comps based around Widows, Rooks and Chameleons (an AT prize that’s effectively a Rook/Gila) from Vydra and their practice partners Hydra. This allowed a key play in the Vydra v Tuskers match where Vydra were able to get a crucial jam on the Tuskers logistics securing a Curse kill. Both Tuskers and Exodus lost winners brackets best of one matches with their respective Vindicator comps, probably suggesting that Vindi comps, even with the 3 points reduction, were not good enough at this stage in the competition (they were playing as 2 of the last 8 unbeaten teams). On day 6 we saw the debut in this tournament of the Octodad comp, 8 Battlecruisers with damage drones. Its first game didn’t show quite how spectacularly strong this comp actually was in this meta, a very close drawn out brawl between NC. and Vydra but its second appearance proved absolutely dominant in clinching that Best of Three. We didn’t see other teams react to the revelation of this comp and so, in the final weekend, what was christened the “Octodad” comp for its 8 battlecruisers was the exclusive property of the Hydra/Vydra stable. I love this comp. It takes maximum advantage of this year’s point change that made battlecruisers cheaper, it eschews control and logistics for pure raw damage and it wrecks people. It recalls one of the most exciting AT comps of all times, the famous Ten Thorax comp that ended BOB’s early dominance of the Alliance Tournament. As a tournament player I can’t wait to try it in scrims. If the first two matches of this new comp had been subdued affairs the third match it was used was quite sensational. On Day Seven Hydra drew the Tuskers in a Best of One, warped everything to zero and all tried to use the MJD beacon at the centre of the arena to get behind the Tuskers team, allowing them to pounce on an unfortunate logi and bomber to create an uncatchable advantage. While the Octodad comp wasn’t unbeatable it was strong enough that it gave a massive final weekend advantage to the two teams that had been aware of it: Hydra and Vydra. LAZERHAWKS tried a version of it but some choices (eg Navy Augurors) seemed poorly thought out and their Octodad variant lost to Vydra’s much more polished version. Day 8 saw LAZERHAWKS struggle against Hydra Reloaded’s ECM setups: one based on Chameleon with 2 Rooks, the other an Etana double Widow tinker. LAZERHAWKS even tried a bizarre strategy of banning out all the best ships from the Octodad comp then bringing a version of it which didn’t end well. And that set the stage for the final between Hydra and Vydra. This thrilling best of five was dominated by Vydra’s Octodad comps: the standard Harbinger hull based version being used in one match and a Drake hull based variant being dominant in two others. Hydra’s Widow Tinker also featured and looked very powerful. A splendid tournament for meta with a wide variety of successful comps and a very fun looking and very accessible comp dominating the last weekend. This was a tournament of shock results with the two outstanding upsets being Templis CALSF’s victory over Hydra on Day 1 and The Initiative’s victory over Pandemic Legion on Day 4. The unfortunate Mawderator had put a lot of effort pre-tournament into predicting the results and ended up getting nearly every call wrong. It was an open tournament full of possibility with what most people may have considered unlikely teams going deep. However this wasn’t just random chance. What was underlying these results was an unprecedented level of hard work and training. In particular some teams spent a lot of time practicing using the MJD beacons and this helped give us unexpected results like A Band Apart’s win over VOLTA. 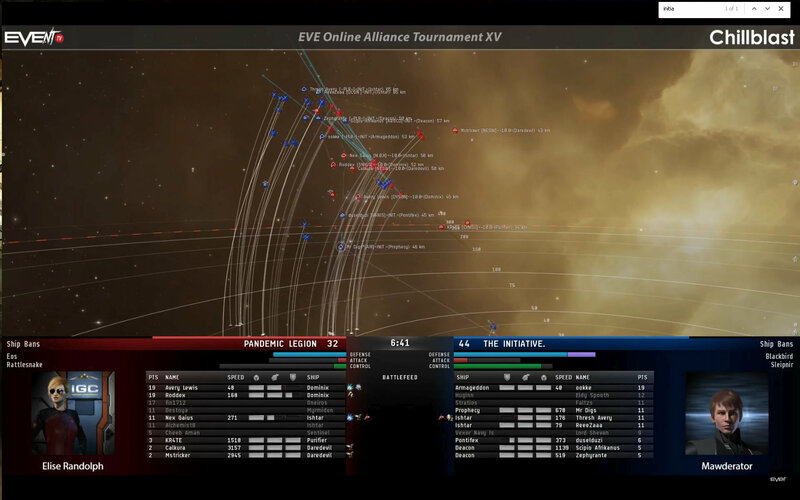 This was the highest quality tournament Eve Online has ever seen and it wasn’t particularly close. Storied teams like Hydra and PL appeared to be on a similar level as teams that had previously been considered “mid-tier” but who had put a ton of practice in to bring their execution up to the level needed. 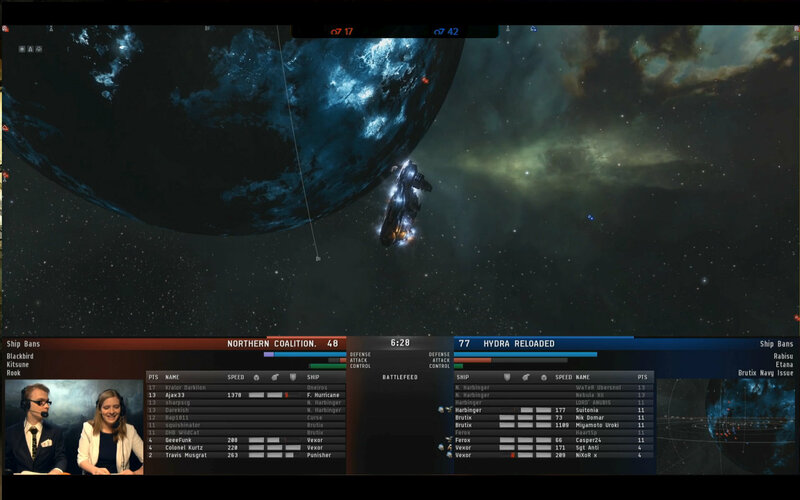 We saw a lot of great frigate piloting in particular and these 2 point newbie-friendly ships proved decisive in many matches when flown to their fullest potential by skilled pilots like KingTut of LAZERHAWKS, Randolph Sykes of Vydra and Travis of NC. There has never been a better tournament. There has never been a better time to get interested in participating in future tournaments. 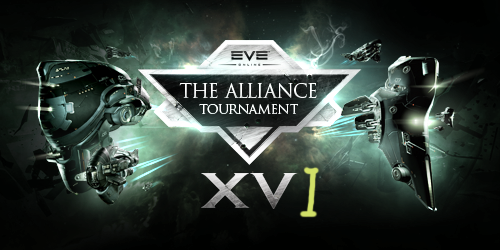 The fast-evolving meta, the central role of the teleporting beacons, the wide variety of teams who have a chance to finish in next year’s prizes and the stellar quality of the presentation of this esport make Eve’s Alliance Tournament the jewel in the game’s crown it was always meant to be. Well done and thanks to everyone involved and I hope everyone enjoyed themselves. Callduron is a space hobo who likes finding whatever weird and wonderful thing is over the next horizon and blowing it up.